Acquired with CCDAutoPilot 2.53. Processed in CCDStack, Registar and Photoshop CS. The large galaxy is IC 0983 (Arp 117) at mag 11.7. The adjacent galaxy is a spiral, IC 0982, mag 13.2. 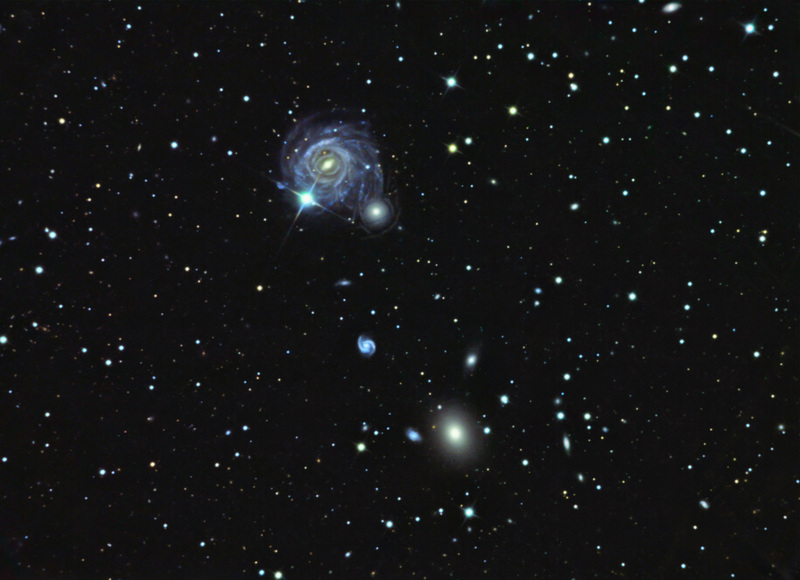 The large elliptical galaxy near the bottom of the frame is NGC 5490, mag 12, and the tiny blue spiral in between is NGC 5490C, mag 13.9. North is slightly left of vertical. I re-processed the above image with the method described by Jay Gabany at AIC2006. His method was able to bring out more of the tendrils of IC0983 as they stretch out and interact with IC0982. Furthermore, there was a dust lane brought out by Jay’s method in IC0982 as well as some circular features. The original image is presented below.